Designs images were unveiled for modern Augustus Saint-Gaudens’ 1907 Double Eagle coins just months ago. Now 2009 Ultra High Relief Double Eagle Gold Coins are in production at West Point, the United States Mint announced Monday. With that, everything is in stride for an early 2009 release that is sure to delight coin collectors. "This gold ultra high relief coin, evoking Augustus Saint-Gaudens’ 1907 Double Eagle with Liberty striding forward, is one of the world’s most beautiful coins," Director Moy told the crowd. "The United States Mint is proud to render the vision of President Theodore Roosevelt and Augustus Saint-Gaudens in a way that honors our past and raises the bar for the future. One hundred years from now, I believe the 2009 Ultra High Relief Double Eagle Gold Coin will be remembered as the birth of the greatest American century in coin-making history." The $20 denominated collector coins are minted in 24-karate gold, have a diameter of 27 millimeters, and are 50 percent thicker than other U.S. one-ounce coins. The gold pieces are set for an unlimited mintage and will be sold only in 2009, unless inventory remains for 2010. In 2010, palladium versions of the famous design will be struck should the Original Saint-Gaudens Double Eagle Ultra-High Relief Palladium Bullion Coin Act become law. The first coin struck will be placed in the National Museum of American History of the Smithsonian Institution. The second is to be an addition to the United States Mint’s heritage assets. "Maintaining the full artistic integrity of the Saint-Gaudens design was an arduous undertaking in 1907. The United States Mint’s first attempt-a 34-millimeter ultra-high relief coin with Roman numerals-required the coins to be ‘squeezed’ into a press and annealed numerous times. The coining process was impractical for mass production, and approximately 19 coins of this variety are known to exist. These coins are now mostly in private ownership. The United States Mint’s second attempt to produce Saint-Gaudens’ design-a 27 millimeter, ultra-high relief coin with Roman numerals-was in fact two $10 Gold Eagle planchets melded together. The resulting coins were twice as thick. The United States Mint had no authority to strike coins of this specification in 1907, so it melted all but two or perhaps three of these coins. The United States Mint’s third attempt-a high-relief, 34-millimeter coin with Roman numerals-produced a coin with reduced relief that required less metal flow to fill the design and was more practical for mass production. Approximately 12,000 coins were made for collection. Later, in 1907, an additional 361,000 coins with Arabic numerals and a lower relief were produced for circulation. None of the 1907 variants bore the inscription, "In God We Trust." The inscription, added in 1908, appears on the coin’s reverse directly above the sun. 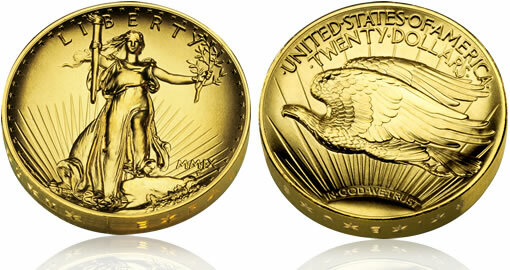 Production of the Saint-Gaudens $20 Gold Double Eagle continued until 1932. Production of the 1933 $20 Gold Double Eagle ceased, and only one was ever lawfully issued – some 70 years later." As approved by Treasury Secretary Paulson, the new coin will have several modern elements. The obverse will feature 50 stars, instead of the original 46 stars on the obverse ("heads" side), which represented the 46 states in the Union in 1907. It also includes the inscription "In God We Trust" in the same position as 1908, when the inscription first appeared with this design. Additionally, a small border was added for a more consistent edge. A price has not yet been set for the 2009 Ultra High Relief Double Eagle Gold Coin. According to the Mint, it will depend "in part, on prevailing world gold prices" at the time they go on sale. What is the price of the 2009 Ultra High Relief Double Eagle Gold Coin?